Some people are bag people. Some people like shoes. Some people like dresses. Me, I like coats. Jackets and coats. I think it's something to do with being a British girl and knowing that for a good 60% of the year the only part of my outfit you're going to see will be my coat. And with jackets, well I'm lazy and I believe changing your jacket can complete change an outfit. I digress. On last count, I think I had 11 coats. I have a mix of bright coats, furry coats, warm coats, trench coats, and of course, the boring black coat (urgh). And now I have a new one to add to the collection, the OH MY GOD IT'S SO BRIGHT MY RETINAS ARE BURNING pink coat. I decided this weekend that I was ready to bring the sequins out. I am strictly "no Christmas before December" person (although I did cave into watching Love Actually on Friday) but I think sequins should be worn all year around. I absolutely love this skirt. I assure you it is not as short as it looks in the photos (sorry Dad! ), but it is a lot shorter than I'm used to. I can't decide if it's shrunk since I last wore it, or if I've just become more of a prude (I fear the latter). Anyway you know what goes great with sequins? Chunky knits. Because while the sequins are stabbing you in the stomach at least you have a cosy jumper on your top half. I love this combination of sparkly and cosy. I wore a very similar outfit a couple of years ago (weirdly, almost two years to the day!) and almost reached for that same mustard jumper again, but then I remembered this big chunky maroon knit I received from Chiara as part of their blogger giveaway. It goes perfectly with the maroon splashes in the skirt. I wore this outfit both Saturday and Sunday. No shame here. I was ill all last week- I came home from work on Monday after struggling through three hours, took Tuesday off and just felt utterly awful on Wednesday. I didn't start to feel human again until Friday- thankfully just in time for the weekend. I had a girly night with my home friends on Friday night eating Mexican food, drinking homemade cocktails and watching Love Actually. Saturday was pretty chilled and then I went to Phil's for the evening. He lives in the middle of town and Manchester was so busy and festive. I love the Christmas lights! We stayed in and watched Sweeney Todd and American History X and hung out with his housemate. Sunday is always a family day, and we ended up with lots of visitors on Sunday afternoon, with two of my uncles, my auntie and two cousins coming round to have a look at our loft conversion. It was so lovely. Last night I had charity choir practice, which I am absolutely loving, so I think I'm on for an early night tonight. Phil and I are going to the Manchester Christmas markets tomorrow evening with his housemate Simon and his girlfriend Meg. I can't wait! I haven't been to the Manchester Christmas markets for years! Today is one year to the day that I started working at Frank Design! Which means I should really get on with that How to Dress for Work post I have been planning since I started working there! Ah I love this! 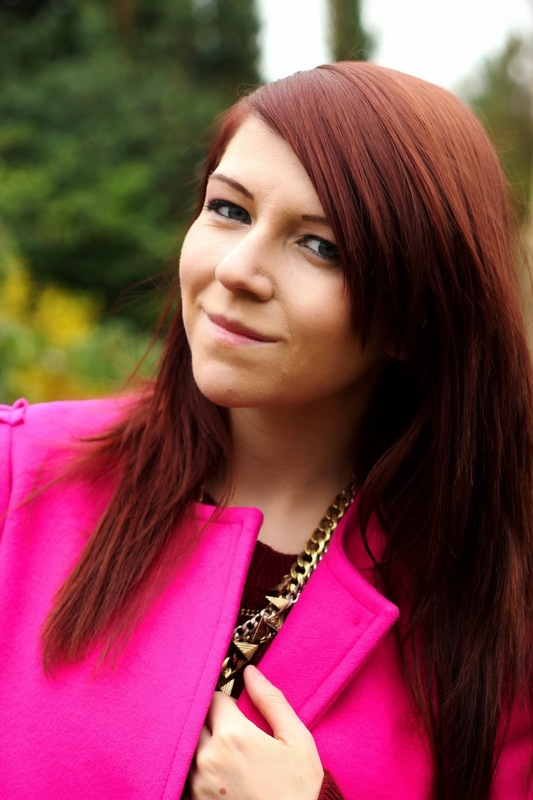 I was looking at how gorgeous your pink coat is and then bam! 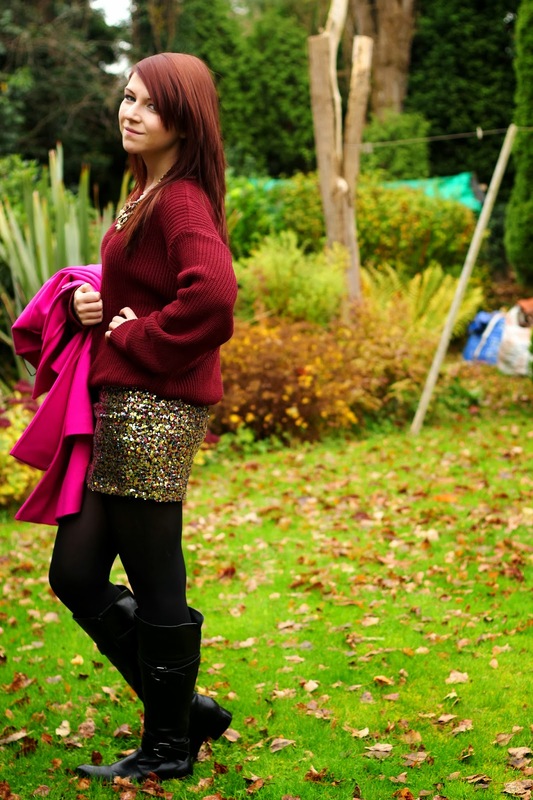 the sequined skirt. Such a fun outfit! That coat and skirt are amazing! Alway thought that pink and red match together perfectly!